The world's smallest aeroplane of its day, the Wee Bee (background) was flown by a pilot lying prone on the fuselage. 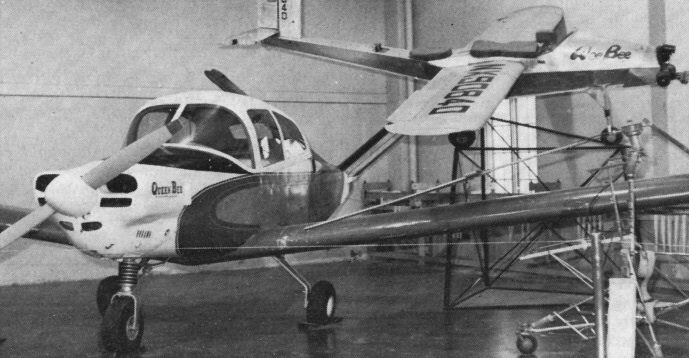 It was designed and built by a group of Convair employees who later formed Bee Aviation Associates Inc and built the more conventional single-seat Honey Bee and, in the foreground, the Vee-tailed Queen Bee. Just visible on the right in this picture is the Urshan Air Chair, a rotorcraft built from surplus parts by Sam Urshan and flown on a tow-line or tethered in a wind. One of San Diego's more remarkable products was the Flying Automobile engineered by Theodore P Hall. The first example was built as a Convair project in 1946 when Mr Hall was that company's chief development engineer. He later founded his own company to continue work on the Flying Automobile, which comprised a four-seat car-type body with a rear-mounted Crosley engine, and a detachable flight section consisting of wings, a tractor Lycoming engine and a tail unit. Several prototypes were flown. A two-seat Fleet Model 7, with 160 hp Kinner R-540 engine, on loan from the Smithsonian Institute. The Fleet company was an off-shoot of Consolidated before the latter moved to San Diego from Buffalo, New York. A Ryan PT-22 Recruit in typical markings of the 1941 period. This aircraft, with a 160 hp Kinner R-540-1 engine, was the last of a series of similar designs derived from the Ryan S-T of 1933, and was widely used at civilian-operated training schools for USAAC pilots, including one operated at San Diego by Ryan.